The last time these 2 teams played Peter Weatherson scored an important hat trick to secure the points for Annan and this match proved once again the importance of Weatherson to the Annan team when he scored a brace to ensure Annan still retain an interest for the remaining play off place. The highly entertaining match swayed one way and then the other with Annan scoring the all important winner in the dying minutes. 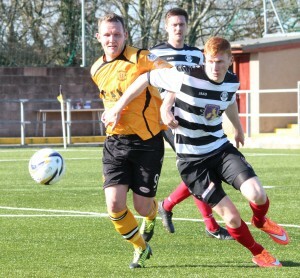 Annan got off to the best possible start when Steven Swinglehurst headed Annan ahead in the 2nd minute. It was a simple goal which caught the Shire defence out when following a Mitchell free kick the ball was not cleared and Swinglehurst headed home from 2 yards. It was the perfect start for Annan against a team bang in form and it was not long before East Stirlingshire showed why they have pushed themselves into the play off contention when David McKenna’s excellent shot brushed past the post in the 11th minute. Annan were being stretched as the swift moving Shire pushed the ball about, testing Annan to the limit. Annan keeper Jordan Hart presented an opportunity to Luke Donnely when the keepers poor clearance was picked up by the impressive Donnely but the Annan keeper redeemed himself to save the well struck shot. David McKenna came close to squaring the game mid way through the half when his well struck shot from the corner of the 18 yard box missed the target by the narrowest of margins. Josh Todd’s header in the 26th minute went narrowly over the bar following a fine cross by Jack Breslin. Andrew Mitchell sent in an inviting cross in the 31st minute which caused all sorts of problems with Todd’s initial effort being blocked and Mitchell’s subsequent effort being easily saved by Barnard. Stuart McColm came close to doubling Annan’s lead in the 34th minute when his low raking shot was superbly pushed on to the post by Ritchie Barnard, from the resulting corner Swinglehurst powerfully headed over the bar form 6 yards. At the other end on loan Partick Thistle striker Kevin Nesbit watched as his shot go agonisingly past the post. David McKenna scored the all important eqauliser before the break, following a corner in 42nd minute and it was more down to poor defending by Annan when goalkeeper Hart failed to deal with the corner swung in from the right with his half cleared punch falling invitingly for the unmarked David McKenna on the 6 yard line and his low shot through a ruck of players found the corner of the net. Steven Black came on for the injured Swinglehurst at half time but it was the vistors who had the first real impact of the half in the 53rd minute when once again there were huge question marks on Annan’s defending when the unmarked Christopher Townsley headed home from a David Greenhill free kick on the edge of the box. It was another bad blow for Annan but the introduction of Junior Ogen up front and with Josh Todd being introduced into mid field at the expense of Ryan McStay started to pay dividends for Annan. The warning signs were evident for the Shire when Peter Watson latched on to Mitchells free kick in the 60th minute only to see his well struck shot go narrowly past the post. Annan were taking the game to the Shire and Weatherson’s 67th minute header was saved by Barnard but a minute later the Annan striker squared the game. Stuart McColm was instrumental in setting up the goal scoring opportunity when his cross from the left was picked up by Junior Ogen and his shot came off the crossbar but Weatherson following up headed past keeper Barnard to square the game. There were half chances at both ends before Weatherson struck again in the 87th minute to seal the points for Annan. Martin McNiff finished off a patient Annan build up when he picked the ball up wide on the left and somehow he managed to send in a superb cross to the back post and Weatherson was there to put his head in where it mattered to score from 2 yards . It was the eighth goal that Weatherson has scored against the Shire this season and his tally deprived them of 10 points from their games against Annan, the goals also puts Weatherson joint top scorer in the league 2 alongside Arbroath’s Simon Murray. ANNAN ATHLETIC: Jordan Hart, Jack Breslin, Steven Swinglehurst (Steven Black ht), Martin McNiff, Peter Watson, Steven Sloan, Andrew Mitchell, Ryan McStay ( Junior Ogden 58 min), Peter Weatherson, Josh Todd , Stuart McColm. Subs not used Calum Cook, Chris Dickinson, Steven Logan, Omar Rabine, Alex Mitchell GK . EAST STIRLINGSHIRE. Ritchie Barnard, Lloyd Kinnaird, Chris Townsley, Connor Greene, David Bates, Luke Donnelly ( Steven Brisbane 22 min), Neil McCabe, David Greenhill ( Graeme McGregor 75 min), Max Wright (Michael Wallace 80 min), Kevin Nisbett, David McKenna,. Substitutes not used Jon Tully, Sean Quinn GK, William Vidlar, Jack Nicholson.